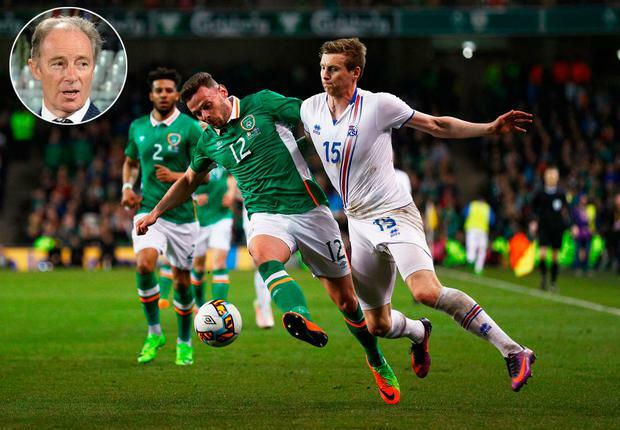 Former Republic of Ireland manager Brian Kerr has said that fans were "swizzed out of an international match" after Ireland's 1-0 loss to Iceland at the Aviva Stadium on Tuesday night. The defeat marked just the third time Ireland have lost a home game at the Aviva under manager Martin O'Neill, and even though the former Celtic boss had made nine changes from the side that drew with Wales last Friday night, Kerr insisted that Irish fans would be entitled to go to the Consumers' Association of Ireland to look for a refund. "It wasn't very good at all," Kerr told RTÉ Radio 1's Morning Ireland. "We're neither a direct a long ball team nor are we a passing team that does some nice things. "The 37,000 people, if there was that there, if they paid in they'd be within their rights to go to the consumer association and look for their money back. They were swizzed out of an international match. "We had only two players that you'd consider regulars: Robbie Brady and James McClean. Iceland had three. "The match was pitched as an international between a team that had got to the [quarter-finals] of the Euros in the summer and the Republic of Ireland, but really it was the Ireland second string, and in some cases third string, against Iceland with most of their best players not present. "The game itself was poor. It was low tempo. There was very little pattern to it on our side. We're a bit like a mongrel dog with no nice patches on it. With first-team regulars James McCarthy, Wes Hoolahan and Harry Arter all unavailable through injury, and with Glenn Whelan sent back to his club side Stoke, O'Neill was forced to dig deep into his midfield stocks with Conor Hourihane making his international debut alongside Jeff Hendrick in midfield. Hendrick spoke last week of Ireland having to collectively account for the absence of creativity through the loss of Arter and Hoolahan, however, Kerr insists that the Burnley midfielder must shoulder more of the responsibility on a night where Ireland registered just one shot on target. "We looked like a team that was thrown together at the last minute without any work being done or practice being done on the old 4-4-2 system, whereas Iceland had a clear style about them," he said. "We've now had three home games recently - Georgia, Wales and last night - and we've hardly created a clear-cut chance in those three games. "We were poor in the middle of the field again. Jeff Hendrick has to be the main culprit last night because he's the experienced player at this stage. "We didn't get on the ball, didn't create anything. It appears that if Wesley Hoolahan doesn't play, we don't create any chances."